The Budget Portal contains budget data for Virginia General Assembly sessions back to 1996. Budget data is organized by session, and by default, the portal displays information for the most recent session. The Budget Portal homepage provides links to all the budget data for the selected session. 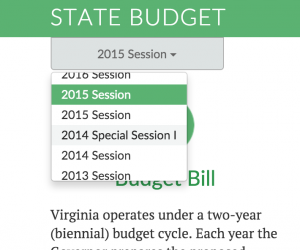 Near the top of the left sidebar, under the State Budget link on the green bar, you will find the Budget Portal session selection button. This button indicates the session for which data is displayed. Click the session button to view a list of session years. Pick a session year to open the Budget Portal homepage for that session.